Small Aquarium Fish makes wonderful Pet for Kids and children. Although there is an amount of effort and work involved to provide care for the fish, it is always a good experience for them to learn up about sense of responsibility. Selecting the right fish may not be an easy task because basically as a parent, you might want to look into getting a fish that requires little care and effort, a starter fish hardy enough to withstand different living condition. But bear in mind that, whatever pet fish you get for your kids, it’s also part of your responsibility to help them care for it and make them understand to learn every aspect of fish keeping hobby. 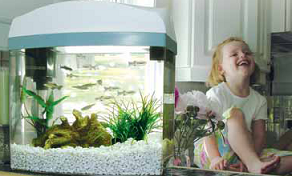 Although the most obvious choice of pet fish for kids is goldfish, this may not be necessarily the right choice after all. In fact, parents often make mistakes by getting fish bowls, which are inexpensive, and a small goldfish hoping that this would please their children. Soon enough they will find out that the goldfish will outgrow the small bowl that they used to live in, and even worse the fish will die because of suffocation cramped into such small confinement. What’s even worse is that, goldfish will also generate a lot of waste and without filter, water will become dirty easily, thus I would not recommend them as suitable choice of pet fish for your kids. Based on my own experience, the best fish for children should be either platys, swordtails and guppies. The reason why this is so is because those all are hardy fish and they don’t grow to very large size, often reaching roughly about 2 inches in length. The fish species are also colorful especially platys which exhibit a very dark bright red coloration while guppies has mix of different shades from green to yellow on their body and fins. Although it would be sensible to get a small fish bowl, I wouldn’t recommend doing so, because such tight living space that holds little amount of water requires a lot of work to constantly changing the water to maintain good water quality. Instead, the best option to house your new pet should be a mini fish tank which measures about 5-gallon capacity and believe me, your kids will definitely love them.